A deep freeze may have settled over the D, but that doesn’t mean fun and entertaining activities in the city are frozen out! There are plenty of fantastic events lined up to make sure January is still a sizzlin’ month for Detroit. Detroit is known as the Motor City, so it only makes sense that a visit to the 2019 North American International Auto Show is a MUST! Having opened its doors to the public on Saturday, this year marks the last time this event will take place in the wintertime, with the 2020 auto show slated to take place outdoors during June. The NAIAS closes out on Sunday, so don’t miss out on this family-friendly event! Tickets are $14 for adults, $7 for seniors 65 and up, $7 for children ages 7-12, and children 6 and under are free with a parent or guardian. The hours are 9 a.m. to 10 p.m. through Saturday, and 9 a.m. to 7 p.m. on Sunday. Since Ford Motor Co. took acquired the old Michigan Central Station, it has continued to come up with ways to make this Detroit landmark open and available to the public. This week, you have the chance to head to the city’s southwest side and enjoy some nostalgia-driven festivities, which will include a first-of-its-kind exhibition of train station artifacts and history. Bundle up and bring the whole family out to enjoy a 3D light show, live graffiti painting, community performances, ice carving, local vendors, fire pits, s’mores, food trucks and more! Shuttle pickup starts at 5:30 p.m., with the last pickup being at 8:30 p.m. The last shuttle will drop off at 9 p.m. during the week and 10 p.m. during the weekend. MCS Winter Festival will be going from 5:30 to 10 p.m. Friday and Saturday, and from 5:30 to 9 p.m. on the weekdays. The final day to enjoy this excitement at Michigan Central Station will be Sunday. 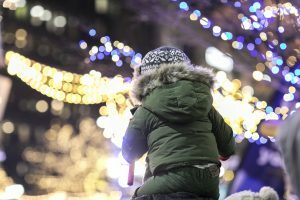 It’s the 14th year for this downtown winter festival, and due to its popularity, Quicken’s Winter Blast has morphed from a three-day event to a free, four-weekend event. The first weekend has passed, but this weekend, Feb. 8-10 and Feb. 15-17 still remain. Located in and around Campus Martius and Cadillac Square, this event features fun winter activities like ice skating, ice sculptures, marshmallow roasting, winter slides and more. This Saturday, “The Voice” finalist Laith Al Saadi will be performing at 9:30 p.m.
As an added bonus, you can stop by various Chemical Bank branches through Feb. 17 for a free hot chocolate and marshmallow coupon while supplies last. Fridays: 4 – 11 p.m. Looking for even more wintertime activities to enjoy with your family and friends? Check out the suggestions from visitdetroit.com.